This is an account of an undercover U.S. government inspector sailing to the United States with central and eastern Europeans in steerage class from Gdansk, Poland, in 1908. “The steerage was located in the bow of the vessel. The first entirely enclosed deck extending the entire length and width of the steamer was termed the main deck. On this there were three large compartments. The foremost of these was assigned to the use of families or women with children. The next, not being required for sleeping quarters on this trip, had its beds piled in one corner and was supplied with long wooden tables, having benches attached on either side. This was the dining room, also the general lounging place in stormy weather. The third room was the sleeping quarters of women traveling alone. 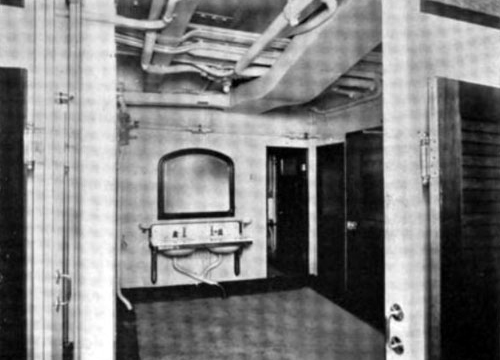 “On the deck below were three similar compartments. The men slept in the middle one of these. The other two were not used on this trip. The beds were the usual iron frames used in the steerage, built in two tiers and of the required dimensions. Each was supplied with a mattress and pillow of sea-grass and covered with a colored slip, a pair of gray blankets and a life-preserver acting as a second pillow. These beds received no attention from the stewards through the entire voyage. Besides being a sleeping place, each bed also served as a repository for all hand baggage, additional clothing and food, and as a rack for towels. “Whatever belongings the steerage passenger had with him must be tucked away in his bed. Each berth, littered as it necessarily was by every possession that the passenger could not wear or carry continually on his person, was nevertheless his one and one place of refuge or withdrawal. “If the pipes running overhead sprung leaks, as they did on several occasions, garments were safer under the blankets than on top of them. As for privacy, that is left entirely out of consideration in the steerage, where people are housed together in such large numbers and must spend every hour of the twenty-four, and this for many days, in the presence of so many others. “This entire lack of privacy accounts for more than one of the filthy or indecent habits of the immigrants on board. People, both men and women, who were ordinarily cleanly about their person, complained that it was totally impossible to keep clean with the given accommodations. A self-respecting person couldn’t wash properly in a room that was being used at the same time by several others, and there was no avoiding becoming dirty. . . .
“The floors in all the steerage quarters except on the main or open deck, were made of large sheets of iron. In the sleeping compartments, though the floors, even under the berths, must be kept free of baggage, they were never washed. They were swept in the morning in preparation for daily inspection by the captain and his officers. And whenever the waste accumulated, it was again swept. But this sweeping by no means kept the floor clean. No sick cans or receptacles for waste of any kind were provided. The sea was rough much of the time and there were many sick. This alone kept the floor wet and in an awful condition, and since it was never washed, the smell from it was dreadful. The cleaning and littering of the floor went on in regular rounds. . . .
“The sleeping quarters were always a dismal, damp, dirty, and most unwholesome place. The air was heavy, foul, and deadening to the spirit and the mind. Those confined to these beds by reason of sickness soon lost all energy, spirit, and ambition. A division of the steerage into two classes was soon apparent. Those who were good sailors and could be up and out kept away from the sleeping rooms until very late and left them often as early as 5 a.m. Those whom seasickness rendered weak and helpless in their beds were so stupefied and enervated by the heavy, foul atmosphere that they continued to lie in their bunks as though in a stupor. Such surroundings could not provide a frame of mind with which it is desirable that newcomers approach our land and receive their first impressions of it.